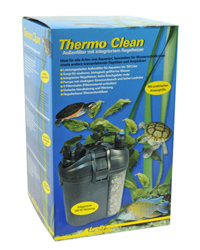 The filter includes a 100W heater which ensures the reliable heating of the aquarium without the risk that turtles will play ping pong with the heater and damage it. This is a common and very serious problem as the risk of electrical shocks exists if the typical aquarium heater is damaged. The heater of the Thermo Clean is safely installed inside the filter itself and therefore well protected.